Our curriculum also includes foundational instruction in product management, and I consider it fundamental to how students learn about professional design practice. Product management is the set of skills that bring a product to market. It’s about developing meaningful insights into human behavior, crafting a product vision, identifying product/market fit, and managing a product roadmap. We already saw the importance of teaching synthesis to students. Product management leverages those synthesis skills. First, students develop actionable, meaningful insights. These insights come from translating design research into provocations about human behavior. Students interpret their research findings, ask “why”, and identify connections and themes they see emergent from what people do and why they do it. An insight is an assertion. It describes how people are or want to be, and generalizes from a small set of participants to a larger population. For example, if students were exploring the topic of school debt, they may have conducted research with college students. During the research, perhaps they noticed that one participant was piling up student debt notices, unopened; another was repaying their loans only haphazardly and irregularly; and still another was using their loans to buy food and other things that aren’t related to school. Through synthesis, the student may have identified a theme around irresponsible behavior, and then interpreted that to mean that student loans were surrounded by a context of fear. They made an inferential leap that the participants they observed were acting irresponsibly because they were afraid of confronting such an insurmountable amount of debt. There are several important qualities to this insight. First, it builds on the research that the students conducted. There’s a narrative thread that can be tracked from the insight back to the discrete observations from their research, and that gives them the ability to tell compelling stories that support the insight. Next, the insight is presented as a fact. Even though research was only conducted with a small set of participants, the student makes a sweeping generalization about the whole population of college students. This inferential leap is important because it acts as a provocation. This is where innovations come from—these inferential leaps identify and point to problems that can be solved. Now, students can begin the process of sketching and exploring designs that will help their participants become less afraid of their debt, and act more responsibly about paying back their loans. Their insight creates constraints, which free the student to explore with more confidence that they are solving a real problem, a problem worth solving. Once the students have developed insights, we start to build a product vision. This is the solution to the problem; it’s the way to fix the problems identified by the insights we’ve built. Students go through a divergent and convergent ideation process. First, they develop as many different ideas as they can in order to explore the problem space. They produce new innovations that build on their insights. For example, now that we have an insight that “Students are afraid of debt, and that fear drives them to act irresponsibly”, our students can brainstorm as many ways as possible to help the participants they saw become less afraid of debt. They might come up with new products that show how consistent payments now lead to a shorter debt lifespan, or help students set goals for saving each month, or show them how changing lifestyle activities (for example, drinking cheap local beer instead of expensive imported beer) can give them the money they need to make their loan payments. We come up with as many ideas as they can. We use a variety of forced provocation methods to help students explore non-traditional, unexpected ideas. For example, I may prompt them to identify solutions that include a vehicle, or a pet, or a restaurant. These are things not typically associated with college debt. This form of strange provocation encourages them to make extraordinary leaps, finding ways to connect things that aren’t normally connected. It helps them move through the obvious ideas, into the realm of the absurd, and then, from the absurd into the innovative. As a result of divergent thinking, and over the course of several weeks, students develop hundreds of different ideas. They sketch them at a variety of levels of detail. Some ideas are just written words on a piece of paper, while others are sketched as comics, showing how someone will use the new product to achieve their goals. Then, we begin to converge, and this introduces the idea of “product/market fit.” Students need criteria to assess the ideas they’ve developed. Insights were developed by purposefully making leaps from a small amount of data towards a statement about a whole population. We moved from talking about only a handful of students to talking about all students. That’s critical for presenting an opportunity area, but it doesn’t ensure that the opportunity will be adopted by the market. That’s where product/market fit comes in. Students learn to analyze the opportunity from a variety of market lenses to see if there’s an audience for what they’ve created. For each of the divergent ideas, students identify a total addressable market, which is the maximum number of people that can benefit from the idea. This gives them a sense for ideas that can have broad appeal. To understand how big the market is, they’ll need to conduct secondary research, and think critically about who would actually use their product if it existed. Next, students identify the ideas that are technically feasible. Their ideas need to be built, and if that requires a substantial investment in technical infrastructure, the idea won’t resonate for some time. For example, if their idea requires micro-loan payments, but the loan repayment system isn’t set up to handle payments like this, the road to implementation will be long and arduous. Then, students look for ideas that are politically and socially feasible. Ideas are constrained and governed by laws and social norms. These can shift, but shifting them takes time. We coach students to think critically about their ability to make these changes, and to judge their ideas accordingly. For example, they may identify a new design product that makes it easy for students to file bankruptcy paperwork in order to purposefully default on their debt. But, there may not be a legal way for this idea to succeed (in the US, you can’t bankrupt out of student debt)—and changing the law would be a difficult process. As a result of examining the total addressable market, technology feasibility, and political and behavioral feasibility, students narrow their potential design ideas to a more manageable subset. I encourage them to down-select their ideas to two or three. And then, they create a vision narrative. They develop a scenario that walks through how a user will use these new product ideas to achieve their goal. This vision narrative starts in writing. It’s a story, with the user moving step by step through the system. Quickly, we move to a sketched scenario in a comic style. And then, students develop a realistic product vision. Their student debt application will come to life and will look real. And this can be tested using the evaluation methods we discussed earlier. Students have developed insights, crafted a vision, and identified product/market fit. The last piece of product management is developing a product roadmap. Even though students sketch a product vision that’s comprehensive, in a professional environment, it would be built in stages. A roadmap shows the sequence in which new capabilities will be added to a product. It’s a timeline that introduces a logical approach to new feature definition. For example, if students need to log into a system, the log in feature needs to be built towards the beginning, probably before advanced features are added. The product roadmap forces students to add realism to their idea and to prioritize the most important pieces that fulfil the value proposition and deliver on the idea’s core benefit. Producing the roadmap is iterative. We treat it like any other deliverable; students build the roadmap, we critique it, and then they iterate on it. Product management is a relevant skill because students will inevitably be building digital products. The world is a digital place, and even human-centered services will likely have digital product touchpoints. Students learn take a value-focused approach to product management, so they are prepared to build new ideas in a realistic manner. I wrote a book about creating great products that emphasizes a user-centered design approach to product management. 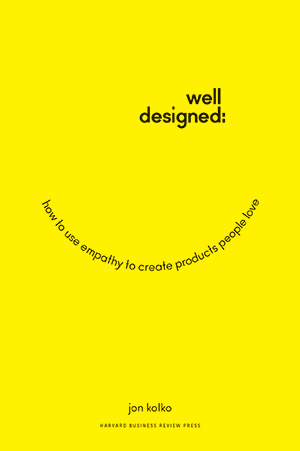 You might enjoy reading more in Well-Designed: How to Use Empathy to Create Products People Love.